Full-back Zaine Francis-Angol was the big winner at AFC Fylde’s awards evening. 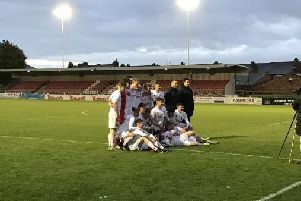 The Coasters celebrated a sensational debut season in the National League, qualifying for the play-offs at the first attempt and pushing League One champions Wigan Athletic all the way in the FA Cup second round. Francis-Angol was integral to Fylde’s success and was rewarded with the club’s Player of the Year award, as voted for by the supporters. The former Motherwell and Kidderminster left-back, who became the Coasters’ first full international earlier this year when he was called up to represent Antigua and Barbuda, was the landslide winner, beating top scorer Danny Rowe to the gong. Fellow frontman Jack Muldoon was presented with the Goal of the Season trophy for his stunning strike in the 6-0 drubbing of eventual champions Macclesfield Town. Goalkeeper Jay Lynch, a summer signing from Salford City, was selected by his peers for the Players’ Player of the Year award, while 17-year-old Serhat Tasdemir was named Young Player of the Year by manager Dave Challinor for a brilliant breakthrough season. Francis-Angol said: “It’s been a great season and to make the play-offs was a huge achievement for both the club and myself personally. “It has been a season that I have thoroughly enjoyed alongside a great bunch of lads and it’s an honour to win Player of the Year.